Matthias Ditsch studied visual communication and exhibition design at the Hochschule der Künste in Berlin. 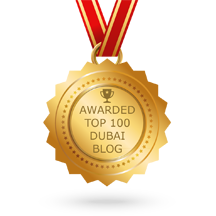 The visionary now lives in Dubai. Classy Dubai met him to talk about his passion for golf. These encounters inspired us to continue to accompany Matthias Ditsch in the future. He has exciting stories for us; far beyond the world of golf. Too important for an interview alone. In the 1980s Matthias Ditsch was one of the first in his field to start experimenting with computers. The combination of such different disciplines as graphics, architecture and design, which converge in 3D design, fascinated him. His diploma topic in 1988 in Berlin was "Pyramids", which led him directly to Egypt. After working for various agencies, Matthias Ditsch became self-employed in 1994. He went to Silicon Valley and experienced first hand the metamorphosis of the Internet into mass-capable technology. And he recognizes the potential for the further development of computers and design. Ditsch founds his own internet agency and the online magazine "Digital Mirror, the magazine for onliners" as a digital "Spiegel". He is not only a pioneer and visionary. Mathias Ditsch is also an entrepreneur. In 1997 he founded with venture capital an corporation whose investors directed his attention to golf. 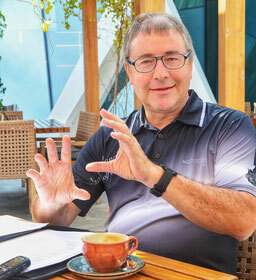 Golf events turn into network and business platforms, as he, who has so far felt more like a nerd among golfers, finds out how many entrepreneurs already play golf. "You hold a golf tournament. Sponsors and entrepreneurs also come to this previously unknown networking platform. I quickly realized myself that golf in nature offers a balance to daily technical computer life. A whole-body sport that balances body and mind. 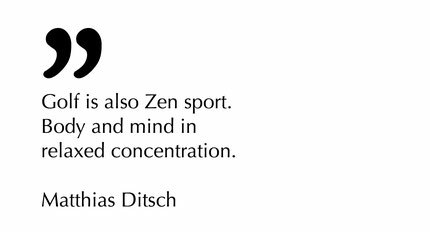 A Zen sport: body and mind in relaxed concentration. The most difficult thing you can imagine. And that's what you learn when you play golf. For me personally, the social component of inviting interesting guests to meet at a high level was and is what counts". The First Golf Business Club is founded in this environment. "A kind of Xing for golfers" he says today. He buys the LLC in 2008 and bundles the golf activities there parallel to his internet agency. He developed the website for a leading golf shop in Munich - a novelty at the time. The result is an online shop and he turns his online golf club idea into reality. "I plead for the right tuning of golf equipment to one's own golf skills. It's the decisive difference whether a golf club really suits you and it doesn't matter which equipment you use. In the top class there are golf clubs for up to 10,000 Euros. For very good golfers this can actually make a difference. But the most important thing is that you find your 'own game' with your own equipment". 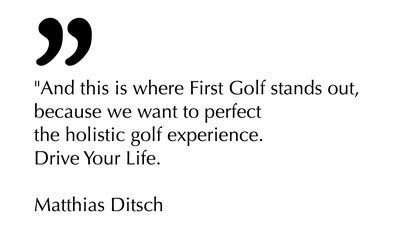 Matthias Ditsch thinks holistically and golf is the sport for it. For a perfect experience all details have to fit together. "A beautiful golf course, nice people, good weather and the right equipment. Then you play better and the game becomes an experience. For the other players and for yourself," he says and lets the thinker feel: "You never know what will happen on the next round. Whether you miss it or are really successful. An element we know from daily life. Most people live in their own safety bubble. But in an interesting life I don't know what happens next. There are moments when I take a - calculated - risk. That's where your life starts to become interesting. Because then people don't live through the same things from morning to night and sit frustrated in front of the TV in the evening. Golf is a good training to exceed your limits. The ideal training area to reflect when and why I play well? How do I deal with frustration when something doesn't work? Isn't this permanent pushing to the limit totally fascinating? The same applies to professional golfers. For me, that's the essence of golf. This constant practice. Even the pros are not always - or probably never - at the level of their desires. But you always want this perfection. A good shot brings this feeling of perfection when suddenly everything works out, both mentally and physically. I find this state of equilibrium fascinating." Our interlocutor has combined biography, sport, philosophy and business imperceptibly and convincingly. 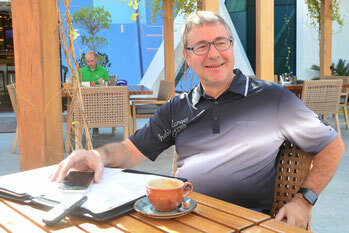 "And that is where First Golf stands out, because we want to perfect the holistic golf experience. Drive Your Life." "This is the First Golf idea of the global online shop, which nevertheless takes care of the individual and the individual and the customers know that they get the best possible equipment for their golf needs at a fair price in order to enjoy golf in all its facets. Are you also a personal contact and advisor? The online world is evolving fast and so there are always new possibilities to advise virtually. What it takes and what really works (there is also a lot of technical stuff that doesn't really help.) I learn with enthusiasm from the daily customer relations. The golfer can also get classic advice in our top golf shop in downtown Munich and try out golf clubs on the simulator. For 30 years we have been selling golf equipment & accessories at a high level, experience that the customer can rely on. We know every piece of equipment and can adapt it individually on site. This is the First Golf idea from the local top golf shop, where customers from Dubai or China also shop. I can then play a nice round of golf with them in Dubai or Shanghai and exchange experiences about golf and business when we meet again. 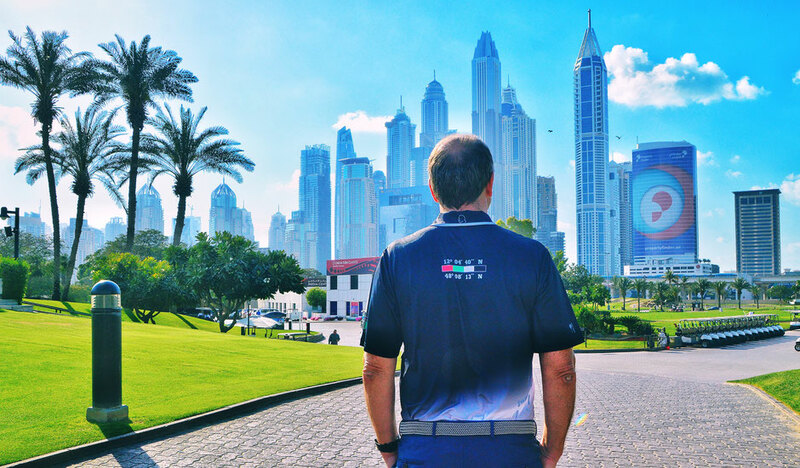 In the First Golf Instagram profile you can read "Golf as it should be". How should golf be? As I said, it's about the "perfect" golf experience. That I can also enjoy when the game isn't going well. The certainty of being optimally equipped and prepared. For us, social exchange is also part of it. Social, human contacts and the shared experience. And not to forget the fun of golf. In this respect, golf networking is an ideal tool for building trust. When I play golf with someone, it is a unique opportunity to get to know each other outside the business world. You get to know your flight partner very well in four hours on the round. For good business it is very helpful if the personal level is also right. You won't sign a contract at the end of the 18th hole. But it is no coincidence that many good deals start on the golf course. But the First Golf idea is not only business golf, it is also the intention to bring the beauty, aesthetics and elegance of golf to life. This also includes the location, the golf course, the club house as an important element. Everywhere we as First Golf can support and consider where we can help the member to experience his sport more easily, more pleasantly, more comfortably, perhaps more deeply. What does his dream golf course look like for the aesthete and sportsman Matthias Ditsch? I already have a very good idea for Dubai. But more about that later. The decisive factor is the interaction between man and nature. In my opinion, Asian garden art is well advanced in this respect. With a deep understanding of the human connection to nature. On a golf course, I soon see whether the planners and landscape architects have established a relationship with nature. There are golf courses where this was not successful and the golf courses were cut into nature like foreign objects. There is no impression, no feel-good effect. And there are golf courses like here (in the Emirates Golf Club - Classy Dubai). There you can really feel the power of the plants and although planted by humans, a piece of beautiful nature is created. But the most fascinating golf courses are situated in fascinating nature, like Pebbles Beach on the Pacific coast. It's not easy to imitate that. Simulating nature is challenging. But there are many successful sites that harmonize with nature. Golf courses fascinate me from the sporting side, if they are challenging but fair. Island greens are such a case, where the excitement increases and victory and defeat are closely linked. I find bunkers rather annoying, but they also have to be there from time to time. Fascinating are also higher tees on fairways or greens far below. Which are for you the three most beautiful courses you have played? There are over 35,000 courses worldwide. I have played in USA, China, Morocco and Canada. Everywhere I go, I try to play at least one or two places. One of the most beautiful was Torry Pines near San Diego/California. That was great, that Southern Californian landscape right on the Pacific. The second Brijuni Golf Course is located on the Brijuni Peninsula in Croatia, where the European aristocrats spent the summer. The course was founded in 1922, so it is one of the older in Europe, a Mediterranean, old cultural landscape. Today the golf course is situated in an ecological park. There herds of roe deer or rabbits cross the course and even peacocks run free on the fairways. A fantastic feeling to play golf in this paradise. Last but not least, the Emirates Golf Course is one of my three top addresses. Located in the middle of the city, in front of a great skyline, this course still gives you this feeling of nature that I find so important. I didn't know that in this form yet. Keyword "Digital World". How will it influence the game of golf? Here is an interesting example. It was at a tournament in Singapore. At the press conference, Ernie Els, one of the most famous professional golfers, was asked why younger golfers are so much better today. He replied: "Today they have the ability to analyse every tee and every round precisely via sensors or the Internet. A way to learn that you didn't know before". On video in slow motion you can analyze every mini movement in detail, see exactly the need for optimization. A good coach can then specify exactly where to start. You move your arm a little differently and you play much more effectively. These are details that can make a difference at Golf. Modern digital analysis technologies make these small differences visible. But the human factor cannot be replaced, but rather the interaction. Because I think technology should be used where it makes life better or more pleasant. But I don't want to live in a cold synthetic robot world. It would probably be possible to build a golf robot today that humans would no longer have a chance against, but the exciting thing is our creativity, our own challenge and how to deal with imperfection. Is that why golf is so popular with people who have left the comfort zone? That is quite clear. Many don't want to face it. Golfers, on the other hand, are familiar with it. They are permanently in this situation and notice that golf also reflects this. That's why they can handle problems more easily and still have fun. Even if I am annoyed for three hours, I say "Ok, it still made sense". That's why many people are fascinated by golf. Nothing simply works without obstacles. I think if you don't have any problems, you do something wrong. Golf would also be a good school sport, because you can experience the limits and train yourself to master uncertain situations. I experienced that myself. I used to be quick on the edge, but now I have it under control because golf teaches you how to deal with frustration. The next tee is a success again and you are well again. The essence of golf is not only to play beautifully. That usually doesn't work anyway. Deep in there you want to reach perfection, but you never get there. The next level already follows. A scenario that only lets you reach the optimum, but never the maximum. You feel with the time, that is a tedious way, but it is worth it. You can't buy this satisfaction. I believe in this combination of desire for perfection and never arriving. Don't give up, start over and over again and then suddenly completely new possibilities arise. And that is when something works that you wouldn't have thought possible in the past. What can you find in Matthias Ditsch's golf bag? Good tailor-made SLDR clubs and a Daddy Long Legs putter from Taylor Made. I've also recently added some Honma clubs that I use where I can because it's just a new class in the game. Our golf shop in Munich is an authorized Honma dealer. This is the top Japanese brand, where every club is handmade with the utmost precision and attention to detail. The secret lies not only in the club head, but much more in the perfect matching of head and club shaft and in the so-called feedback, the feeling for the ball, which is generated by it. You can feel with every swing that this is another level of golf equipment. Golf clubs are the most difficult product to sell online because you can't hold them in your hand and try them out online. Hence our idea to provide potential customers with rental clubs so that they can test them on the golf course or they come to the golf shop, try them out there, get fitted, then we can quickly send them the finished clubs worldwide. And then there's the ball marker, a silver coin 50 years spaceship Enterprise. What are your visions for First Golf? 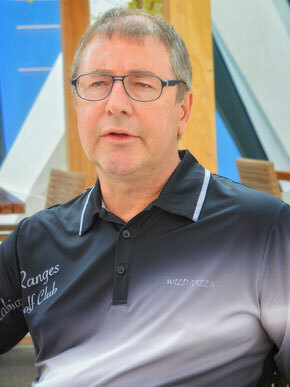 My vision for First Golf is to be a global golf business club with an integrated online golf shop that offers the best 5,000 golf products and can quickly send them to customers globally. No matter where the customer is, he should have the opportunity to get his ideal equipment and be optimally guided. Drive Your Life!